Did you know… that there’s realtime 3D-warping inside SCRATCH? This is a really cool one that you won’t find in any other grading/finishing app out there: Realtime 3D-warping – even on 8K images. 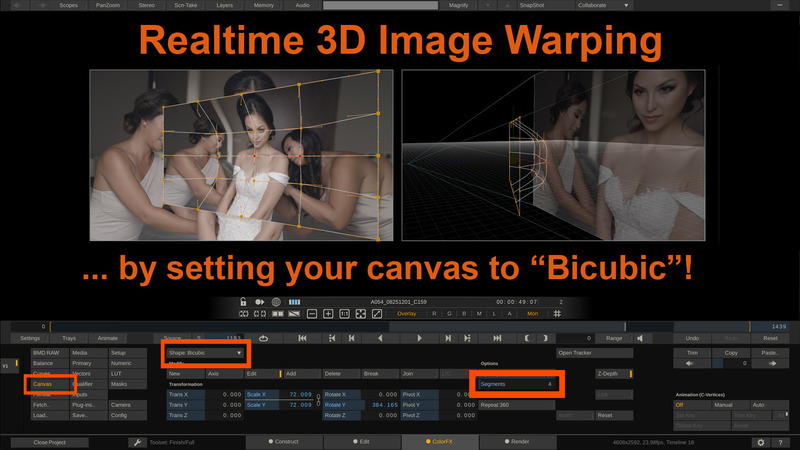 Just set your Canvas to “Bicubic” and dial up the Segments parameter. If you enter edit mode you can warp your image in any way you want. If you turn it by 90° you can also warp it in Z-space. The hotkey for the perspective view is “P” 🙂 . Did you know… how to change the playback speed? Did you know… how to copy grades between versions? Did you know… that you can Alt-Click the Reset button? Did you know… that you can easily transfer your grades from one timeline to another? Did you know… that you can select rows of clips in your timeline? Did you know… that you can store global plugin presets? Did you know… that you can create emergency licenses on your own? Did you know… that you can extrapolate your animations? Did you know… that you can sort your Matchbox shaders into subfolders? Did you know… that you can Alt-Click thumbnails on the filmstrip?